Focal choroidal excavation (FCE) is a concavity in the choroid of unknown etiology, occurring without any adjacent scleral abnormality or ectasia, and characterized by good visual acuity and shows minimal changes over time. It was first described with time-domain optical coherence tomography (OCT) by Jampol et al. in 2006. In 2011, Margolis et al. named this entity “focal choroidal excavation” in a report of 12 patients including one with bilateral involvement. FCE is believed by most authors to be a congenital condition, though its etiopathogenesis is yet unclear. FCE is detected primarily as an OCT finding. FCE is frequently associated with pachychoroid diseases, including central serous chorioretinopathy (CSCR), choroidal neovascularization (CNV), and polypoidal choroidal vasculopathy. Although FCE is classically thought to be congenital, acquired FCE forms possibly exist. To the best of our knowledge, the only known report of acquired FCE is by Lee et al., where they found that, in only 1 out of 38 cases, a small choroidal excavation developed during CNV scarring changes in age-related macular degeneration during a 45-month long-term follow-up. 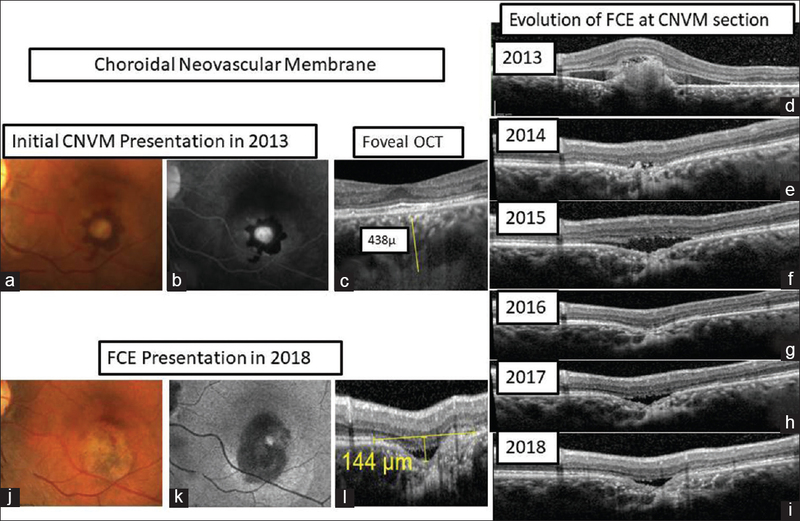 Hereby, we report multimodal imaging of a case of acquired FCE post treatment of CNV membrane (CNVM), which later increased in size over follow-up period after treatment of CNVM. This is an observational case study. Complete medical records of this case showing CNVM with FCE were reviewed. Multimodal imaging findings including color photography, fluorescein angiography (FA), spectral-domain OCT (SD-OCT), enhanced depth imaging (EDI), and OCT angiography (OCTA) were performed with the Heidelberg Retinal Angiography and Optical Coherence Tomography System (Spectralis, HRA-OCT; Heidelberg Engineering, Heidelberg, Germany) and were analyzed. Measurements of the various dimensions of the FCEs were performed using the caliper feature on the macular line scan of SD-OCT. The greatest linear dimension of the FCE was measured as the maximal vertical distance measured from a horizontal line drawn between the two points, from the retinal pigment epithelium (RPE) horizontally to its lower bulge inferiorly, using a cross-sectional line scan directly across the FCE. The choroidal thickness under the excavation was defined as the distance between the outer border of the RPE and the inner scleral border, using the EDI mode of SD-OCT. Morphologically, FCEs could be classified on the basis of the relationship between the outer retina and the choroid. In the conforming type, the outer retina conforms to the choroidal excavation with preservation of the junction between the photoreceptor tips and the RPE. The nonconforming type corresponds to FCEs with a separation between the photoreceptor tips and RPE, forming a subretinal space. A 48-year-old female presented to us with blurring and distortion of vision in the oculus sinister (OS) for 2 weeks. Her best-corrected visual acuity was 6/6; N6 in the oculus dexter (OD) and 6/24 N10 in the OS at presentation. Fundus examination showed subretinal hemorrhage with a grayish lesion suggestive of an extrafoveal CNVM. Based on multimodal imaging such as SD-OCT and fundus FA, the patient was diagnosed to have extrafoveal type 2 CNVM with subfoveal choroidal thickness of 505 μm. She was also treated with anti-vascular endothelial growth factor (VEGF) monotherapy on pro re nata (PRN) basis and had multiple recurrences over a period of 5 years with preservation of the fovea and restoration of final visual acuity to 6/7.5; N6 in the treated eye. Interestingly, she developed FCE at the site of resolved CNVM scar, during 23 months of treatment, which progressively increased from 85 to 154 μm in depth over the subsequent follow-ups. Hereby, we report this as a case of acquired FCE secondary to CNVM. This case also documents the conversion of nonconforming type into conforming type of FCE over the follow-up period. [Figure 1] shows irregular RPE defects in the area of FCE. Associated CNVM lesion showed an initial grayish lesion with circumferential subretinal hemorrhage juxtafoveally, which resolved after anti-VEGF treatment during the follow-up period [Figure 1]. Fundus autofluorescence showed hypofluorescence in the area of FCE [Figure 1]. FA showed irregular hyperfluorescence at the area of FCE suggestive of window defects till late phase. Leak was seen only in cases associated with CNVM [Figure 1]. FCE is usually seen as choroidal thinning with, cone-shaped or broad irregular excavation of choroid at the level of RPE, either in or outside the macula with near-normal overlying retinal architecture [Figure 1]. 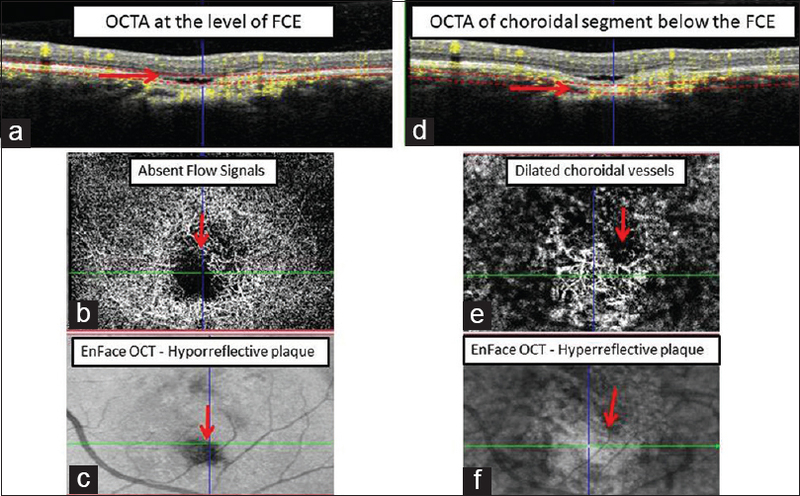 OCTA showed a network with flow signals at the site of active CNVM which resolves after treatment with anti-VEGF.OCTA taken at the level of FCE showed dark flow signal absent area surrounded by hyperperfused areas in the default choriocapillaris slab of OCTA, and a hyporeflective plaque in the corresponding en-face structural OCT. B-scan OCT beneath the FCE showed hyperreflective tissue with intensive flow signals in the choroid segment of OCTA and a hyperreflective plaque in the corresponding en-face structural OCT [Figure 2]. Ellabban et al. suggested, the OCT finding of focal loss of choroidal vessels in the area of FCE and an “unusual hyper-reflective tissue” beneath the FCE lesion could suggest that mechanical changes in the RPE/Bruch membrane in the FCE or scarring of choroidal connective tissue resulting from previous inflammation or ischemia. Presumably, scar contraction could draw the choroid and RPE toward the sclera producing FCE. Our cases support the above alternative etiopathogenesis leading to an acquired subtype of FCE, apart from the known congenital form of FCE complicated secondarily by CNVM/CSCR. FCE can be classified into two types: conforming and nonconforming. Factors contributing to the formation of FCEs into conforming or nonconforming morphologies are uncertain. Initially, the elasticity of the retina allowed the photoreceptors to remain attached to the RPE. With time, eyes with conforming FCE progressed to nonconforming lesions as stress on the outer retina resulted in separation of the photoreceptor tips from the apical surface of the RPE, so nonconforming type seemed to be more advanced than the conforming type. In our case, after successful treatment of CNVM, conforming-type FCE converted to nonconforming-type FCE over the follow-up period. The occurrence of FCE in eyes with increased choroidal thickness has been noted by several investigators., Our case also had increased choroidal thickness with pachyvessel/s adjacent to the excavation, reaffirming the fact that FCE is associated with the pachychoroid spectrum. FCE is an OCT-based diagnosis. FCE is known to be associated with pachychoroid spectrum of diseases, with known associations being CSCR and CNVM. The origin of FCE can be of two types: congenital and acquired. The significance of the acquired variety remains unknown until more such cases are reported. Periodic monitoring of such cases is of importance to detect and treat any of the known associations. Against the common understanding of FCE being a stable lesion, we reported multimodal imaging of a case of acquired FCE post treatment of CNVM, which later increased in size over a follow-up period of 5 years after treatment of CNVM. Jampol LM, Shankle J, Schroeder R, Tornambe P, Spaide RF, Hee MR, et al. Diagnostic and therapeutic challenges. Retina 2006;26:1072-6. Wakabayashi Y, Nishimura A, Higashide T, Ijiri S, Sugiyama K. Unilateral choroidal excavation in the macula detected by spectral-domain optical coherence tomography. Acta Ophthalmol 2010;88:e87-91. Ellabban AA, Tsujikawa A, Ooto S, Yamashiro K, Oishi A, Nakata I, et al. Focal choroidal excavation in eyes with central serous chorioretinopathy. Am J Ophthalmol 2013;156:673-83. Shinojima A, Kawamura A, Mori R, Yuzawa M. Morphologic features of focal choroidal excavation on spectral domain optical coherence tomography with simultaneous angiography. Retina 2014;34:1407-14. Chung H, Byeon SH, Freund KB. Focal choroidal excavation and its association with pachychoroid spectrum disorders: A review of the literature and multimodal imaging findings. Retina 2017;37:199-221.